Grilled Salmon topped with crab meat and lobster cream sauce served with rice and vegetables. 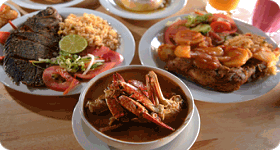 Mix grilledof beef, chicken, shrimp and marinated pork loin (carne adobada) served with rice, avocado and mixed salad. A whole fried tilapia, served with rice, mixed salad and avocado. Grilled shrimp served with rice, refried beans, mixed salad and avocado. Breaded deep shrimp served with french fries and salad. Jumbo shrimp sauteéd with tomatoes, onions and green bell peppers served with rice and vegetables. 8-oz grilled tilapia filet and shrimp served with rice, vegetables, salad and tomato cream sauce. A great combination of tilapia, shrimp, salad, rice, pico de gallo and avocado. Grilled marinated fajita meat served with green onions, rice, refried beans, homemade salad, avocado, chirmol and fresh cheese. N.Y. steakcovered with sautéed sliced onions and bells peppers served with rice, refried beans, mixed salad, avocado and fresh homemade cheese. 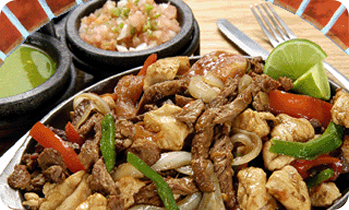 A latin style beef cooked with mixed vegetables in a homemade sauce served with rice and homemade salad. A great portion of rib eye steak with salad, vegetables, rice and pico de gallo. Served with our mushroom graving sauce. A latin style hen or beef cooked with mixed vegetables in a homemade sauce served with rice, homemade salad and beet cabbage. 2 tacos dorados, 2 pastelitos de papa, 2 garnachas, 1 chile relleno served with tomato sauce and salad. Flour tortilla filled with chicken, cabbage, mayonaise, chirmol and onions. 3 Fresh corn tortillas topped with your preference served with guacamole, sour cream, cheese and mixed salad. Choices: Beef, Chicken, Tongue / Pork. 9-oz. Baby beef ribs served with rice, vegetables or mixed salad, avocado and chirmol. Marinated pork loin with a special seasoning, served with rice, refried beans mixed salad, avocado, and fresh homemade cheese. Grilled New York steak served with two eggs any style, rice, beans, plantain, hashbrown and fresh homemade cheese. Flour tortilla filled with beef, cabbage, mayonaise, chirmol and onions. Two 4-oz. ground beef mixed with vegetables, served wih mush popatoes and brown gravy. Bell pepper stuffed with pork and potatoes, served with rice, tomato sauce, refried beans and fresh homemade cheese. Grilled liver topped with sauteéd onions and tomato brown sauce served with rice and vegetables. Two 4-oz ground beef cakes mixed with vegetables, served with rice, refried beans, fresh homemade cheese, tomato sauce and homemade salad. Latin style hen cooked with mixed vegetables in a homemade sauce served with rice and homemade salad. Sautéed vegetable flower dipped in liquid eggs, served with rice, tomato sauce, refried beans and fresh homemade cheese. Grilled or breaded deep fried chicken served with mixed salad, avocado and house specialty salad. chicken breast grilled or sauteéd in cream sauce served with rice, refried beans or vegetables and mixed salad. Consuming raw or undercooked meats, poultry, seafood, shell-fish or eggs may increse your risk of food borne illness. Seasoned flour tortilla stuffed with chicken, onions, tomatoes, served with mix salad, guacamole, rice, pico de gallo and cucumbers. Deep fried corn tortilla topped with diced beef, onions, cilantro, cabbage, tomato sauce and parmesan cheese. Fried plantain served with refried beans and sour cream. Quick Fried Calamari Fresh calamari rings, lightly battered and deep-fried, served with lobster cream sauce. Your choice of mild or hot 8 pieces - breadded chicken wings, served with celery, carrots and ranch dressing. Traditional Guatemalan corn flour cake mixed with chipillin and loroco. Open face crispy corn tortilla topped with mixed vegetables and chicken, beets, cabbage, tomato sauce, boiled sliced eggs, onion & parmesan cheese. A rolled corn tortilla filled with mashed potatoes and sautéen chicken, topped with cabbage, tomato sauce and parmesan cheese. A corn tortilla filled with beans, pork, herb flower and cheese. Tortilla chips buried under chili, melted cheese, pico de gallo, guacamole, jalapeño peppers and sour cream. Sautéed corn cakes stuffed with mashed potatoes with chicken, topped with cabbage, tomato sauce and parmesan cheese. 3 x 1 1/2 oz crab cakes served with lobster cream sauce. Diced tomatoes, onions, cilantro, fresh shrimp, avocado and cucumber marinated in lime juice. Grilled chorizo, chicharrón, salchicha, avocado, fresh cheese and fried tortilla. Fried cassava with fried pieces of pork served with tomato sauce. Nachos served with black beans, chicken, pico de gallo, salsa, guacamole, sour cream and fresh cheese. Served with guacamole, sour cream& pico de gallo. Mixture of crisp lettuces topped with fresh vegetables served with ranch dressing. An exquisit salad mixed with lettuce, cucumbers, radish and avocado. Traditional hen soup with fresh cilantro served with grilled hen on the side. Latin style beef feet soup with mixed vegetables. Traditional chicken hen soup with fresh cilantro, chipilin, loroco, served with grilled hen on the side. A delightful combination of shrimp, mussels, clams, crab shell, calamari and fish (tilapia). Add $0.50 for heavy wipping cream. Latin style beef soup with mixed vegetables. A shrimp, mussels, clams, vegetables and plantain soup served with a whole tilapia on the side. 1/2 Lb. Black angus ground sirloin beef, served with lettuce, tomatoes, onions and french fries. Classic club sandwich with chicken and ham, american cheese, lettuce, tomato and mayonaise served with french fries. 6 Onz jam, lettuce and tomato served with french fries. Thinly sliced beef or chicken sautéed with onions and bell peppers, topped with mozarella or american cheese, lettuce, tomato and mayonaise, served with french fries. Pulled hen with mixed vegetables, mustard an mayonaise, served with french fries. 6 Onz grilled chicken breast served with lettuce, tomato, mayonnaise and french fries. Chicken salad served on soboro bread with our special home made pasta and french fries. Two chilli hot dog served with cheese, chilli and french fries. 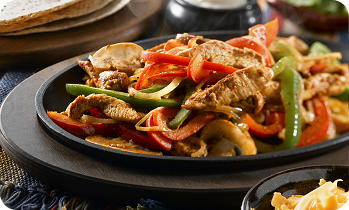 Fajitas are served with rice, refried beans, pico de gallo, guacamole, sour cream, jalapeño, mixed cheese and 3 flour or corn tortilla on the side. 12 shrimps, 9 0z of chicken, 9 0z of beef, 9 oz of pork, 8 chicken wings, 5 garnachas, 4 tacos dorados, served with ranch dressing. 6 shrimps, 6 0z of chicken, 6 oz of beef, 6 oz of pork, 4 chicken wings, 3 garnachas, 2 tacos dorados, served with ranch dressing. Jumbo shrimp and sliced chicken butterfilled, served over a bed of fettuccini alfredo. Andouille sausage, shrimp, chicken, tomatoes, onions and bell peppers sautéed with lobster cream sauce and penné pasta. Your choice of Jam, Spinach or Bacon served with fried plantain, potatoes and sour cream. Scrambled eggs sauteed onions, tomatoes, green pepper and your choice of sausage, ham, or chicken served with refried beans, fried plantain, fresh homemade cheese, sour cream and hash brown. Your choice of beef or chicken served with beans, eggs, cheese and sour cream. Flour tortilla, eggs, onions, bell peppers, fried plantains, retried beans, sour cream and fresh homemade cheese with choice of chorizo or chicken. Two any style eggs, refried beans, fried plantain, fresh homemade cheese, sour cream and hash brown. Two any style eggs with ranchero sauce, refried beans, fried plantain, fresh homemade cheese, sour cream and hash brown. Two any style eggs, New York strip steak served with refried beans, fried plantain, fresh homemade cheese, sour cream and hash brown. Cheese tortilla stuffed with scrambled eggs, chorizo and ham. Served with sour cream and fried plantain. Two pancakes served with scrambled eggs and your choice of chorizo or ham. Toasted english muffin topped with ham, poached eggs and smothered with hollandaise sauce. Served with fried plantain, refried beans and hashbrown. Chicken bites saved with french frieds. refried beans with rice and homemade cheese. 1 Pupusa served with french frieds. Breading fish sticks deep fried, served with french fries and salsa. White grilled bread ham and cheese served with fries. 1 Hot dog served with cheese and french fries.